At this year’s ITMA Asia, to be held from 15 to 19 October in combination with the CITME, Mayer & Cie. (MCT) is focussing entirely on electronic machines. All three machines scheduled to be on show in Shanghai – the Spinit 3.0 E, the OVJA1.6 EE 3/2 WT and the OVJA 2.4 EC – come in this category. It will be the first time the Spinit spinning and knitting machine and the OVJA1.6 EE 3/2 WT, designed especially for knitting shoe uppers, have been exhibited in China. And it will be the first time ever that the OVJA 2.4 EC has been on show. It is an electronic jacquard machine that Mayer & Cie. China (MCN) has added to its product line. “We have noticed for some time an increase in demand in the high-end machine segment in China,” says Rudolf Crass, Mayer & Cie.’s regional sales manager with responsibility for China. “High-output circular knitting machines are trending too.” The new OVJA 2.4 EC that Mayer & Cie. China will present to trade visitors for the first time at ITMA Asia is just such a machine. With its 2.4 systems per inch it is a full jacquard machine that outperforms Chinese manufacturers’ conventional models in productivity. Thanks to its three-way-technology, the OVJA 2.4 EC offers great variety in design patterns. It is aimed at discerning Chinese customers who produce fabrics for outer garments, sports- and leisurewear. The OVJA 2.4 EC is the first electronic machine to be finally assembled at Mayer & Cie. China. During the past years, the Chinese works have continually expanded their portfolio. The most successful – and first – Chinese model is the MSC 3.2 II single jersey machine and its double jersey counterpart the MDC 2.2. Since the end of 2017, a Relanit 3.2 SC with Mayer & Cie.’s tried and trusted relative technology has completed the portfolio for the domestic market. All four machines come with a knitting head made in Germany. Different frame and control panel components are manufactured in Shanghai for final assembly. 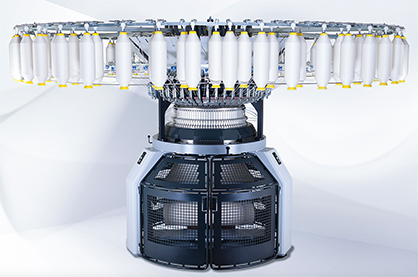 “We are delighted to be able to present our Spinit 3.0 E spinning and knitting machine ‘in the flesh’ at this year’s ITMA Asia,” says Michael A. Tuschak, Mayer & Cie.’s spinitsystems marketing and sales manager. “The technology, how it works and above all the result are always demonstrated the most impressively on the machine itself.” Tuschak anticipates visitors to the Mayer & Cie. stand at ITMA Asia with a strong interest in the spinning and knitting technology. Experience, he says, has shown that the technology is mainly of relevance in established textile markets. Larger companies, such as full-service enterprises or spinning mills with forward integration, are constantly looking for ways in which to set themselves apart from the competition. “With spinitsystems we can give our customers something new,” Tuschak says. By that he means, for one, the product the machine makes. Spinit Fancy Jersey with its characteristic pattern variations can only be made on the Mayer & Cie. machine. For another, the Spinit 3.0 E offers benefits in the manufacturing process. To produce single jersey it requires much less energy, time and space than the conventional process, and that recently won spinitsystems the German Environment Ministry’s Innovation Prize for the Climate and the Environment (IKU). “The OVJA 1.6 EE 3/2 WT is our first ‘real’ shoe machine,” says Hardy Bühler, Mayer & Cie.’s Key Account Manager Brands. He is keenly concerned with the requirements of the shoe upper fabric growth market. The new machine uses three-way technology in the cylinder and two-way technology in the rib dial. That ensures a very wide range of patterns for the multi-colour jacquard machine, which can at the same time produce a hole structure look by means of multiple tuck loops. It also produces plain and multi-coloured spacer fabrics up to 5 mm thick, which Bühler says is very much in demand for shoe uppers. Producing spacer fabrics on a circular knitting machine makes sense for several reasons. For one, set-up times are much shorter than when using other means of production. A circular knitter also uses much less yarn to make multi-coloured spacer fabrics. That above all, Bühler says, makes manufacturing small batches of spacer on a circular knitting machine a winner. In addition to the OVJA 1.6 EE 3/2 WT, the Mayer & Cie. portfolio includes several machines that are suitable for making shoe upper fabric, especially OVJA machines. The Technit D3, in contrast, is a spacer specialist. It knits with three threads on the cylinder side and produces spacer structures with four needle tracks.